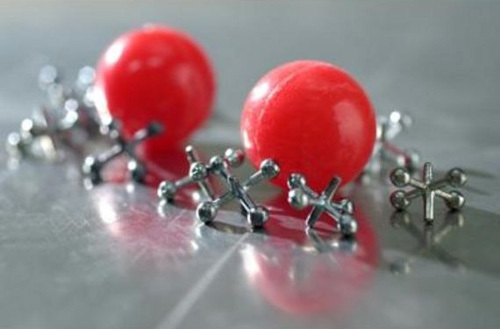 Whole afternoons would go by sitting on the floor with a small red ball, some silver metal jacks, next to my best friend Amy. Best friends who once decided to swear our loyalty to each other as blood sisters by pricking our fingers with a sewing needle, but at the last minute opting for something less deadly, equally yucky, by touching tips of tongues and sharing a cookie. We were inseparable... usurpers of time. We'd spend endless hours riding our bikes around circular streets where rarely a car would pass, or bouncing a pink Spalding and chanting..."'A' my name is Alice and my husbands name is Al, we come from Alabama to sell you Apples", eventually working our way through the entire alphabet. We'd draw crude chalk lines on pavement of rectangular and spiral hopscotch diagrams for jumping on one foot and when we tired of the outdoors, we moved inside to play board games like... 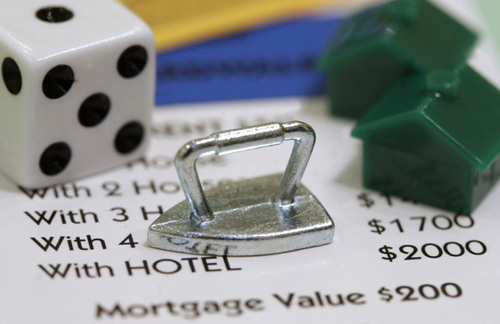 Monopoly and Clue, card games like Spit and Rummy, and jacks to keep busy. When none of the standards worked, we invented games of our own. Like... standing on the corner of Flower Lane and Powers Avenue, in East Meadow, New York directing traffic to the few cars that entered our neighborhood. With arms stretched and palms facing out, we'd stop vehicles then wave them on, handing out paper wrapped, mint flavored toothpicks to those that obeyed. It didn't matter much that a stop sign was erected directly where we stood. Most drivers found the 'sport' amusing, except for one, a policeman, cruising the area in a black and white patrol car, who immediately sent us packing. Or... the afternoon we created a board game on Amy's parents newly hung kitchen wallpaper, a busy tight pattern made up of various small figures and scenes. Two matchbooks sitting on the table became measuring devices and pieces for moving about the board. The whole concept was intriguing, worthy of our attention and possibly Milton Bradley's had he been there to play along. 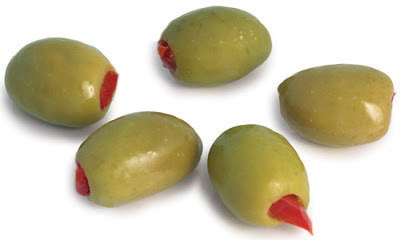 We played the wall game for hours stopping only to devour the entire contents of a large jar of green olives stuffed with pimentos found inside the family's refrigerator. I don't remember ever being hungry as a kid or taking the time to eat lunch, but I do remember the olives and Sylvia, Amy's mother, and her reaction, which wasn't over the top, but held disappointment when she found the condiment jar empty, the one she bought earlier in the day for her cocktail party planned for later that evening. Cocktail Party... two words seemingly incongruous, conjuring images of people dressed to 'the nines', smoke filled rooms, sipping whiskey, and murmuring shallow conversations. Adult fun, just not my cup of 'mar TEA ni'. Fun is different now... sporadic, somewhat intangible, and I'm clueless as to the exact moment when having fun started to require effort. Gone are the seemingly endless days of bouncing a ball, hopping on one foot, pretending, or having unstructured time without obligation, concern, or feelings of guilt for having a day unfold without expectation. I suppose it's about being in the moment and I'm no longer sure I can get there from here, though I try. So here I am, after a 30-minute train ride from Jenkintown, standing across from Philadelphia's 30th Street (train) Station at 'The Porch'. 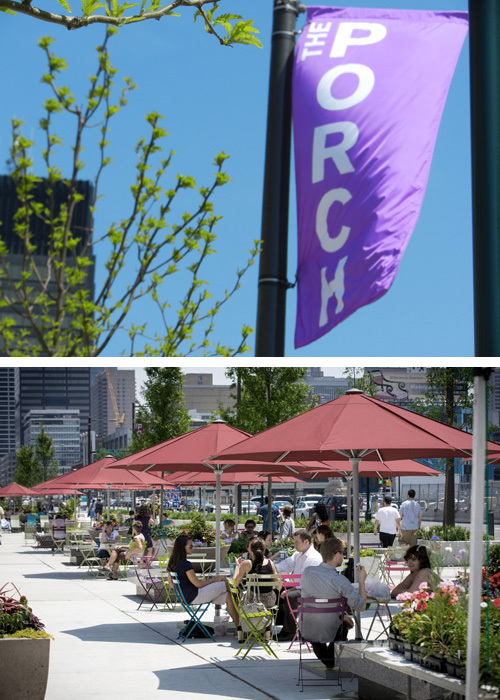 'The Porch', once a parking lane and boring sidewalk, now an urban space fitted with outdoor umbrellas, colorful metal chairs, some lounging, tables and the reason Michael and I are here... gourmet food trucks!... and to have fun! For ages, I've wanted to eat my way around the city sampling street food from a multitude of vendors catering to people who like to eat 'on the run'. But since I don't run, and prefer the more civilized approach of dining while seated in a relaxed atmosphere, I've never taken the opportunity until now. Today the conditions are perfect... cool temps, glorious sunshine, a slight breeze, a view of the skyline in the distance, people quietly lingering about, tables, chairs and... cupcakes, But I'll get to that later. 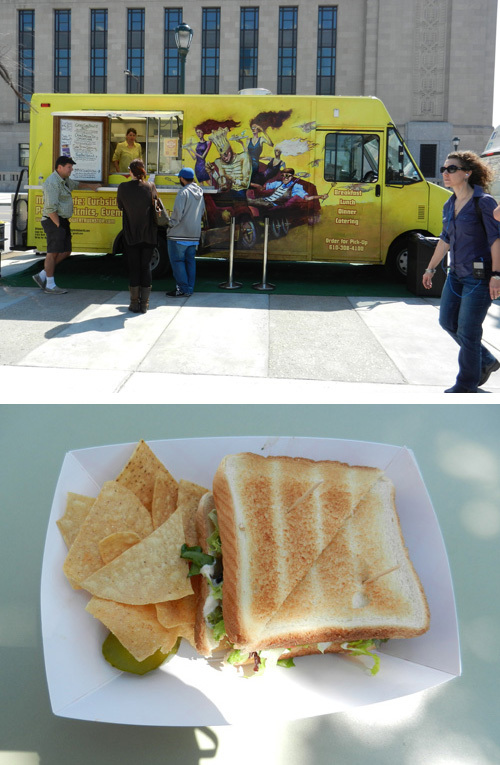 'The Sunflower Food Truck' to split a Green Curry Bacon BLT sandwich comprised of thick slabs of juicy bacon from Burt's Farm, mixed lettuce, tomato, a lime cilantro mayonnaise on Texas toast with homemade tortilla chips and a pickle. It may not look impressive, but after one bite, I instantly regretted not having the whole sandwich to myself. It was the best BLT sandwich EVER! Next we shared some Midwest flavor... Battered Fried Cheese Curds with smoked ketchup from 'The Cow and the Curd', all the while thinking of our friend Richard, a 'cheesehead' from Appleton, Wisconsin, who loves cheese... and oysters, and chocolate... just not together. 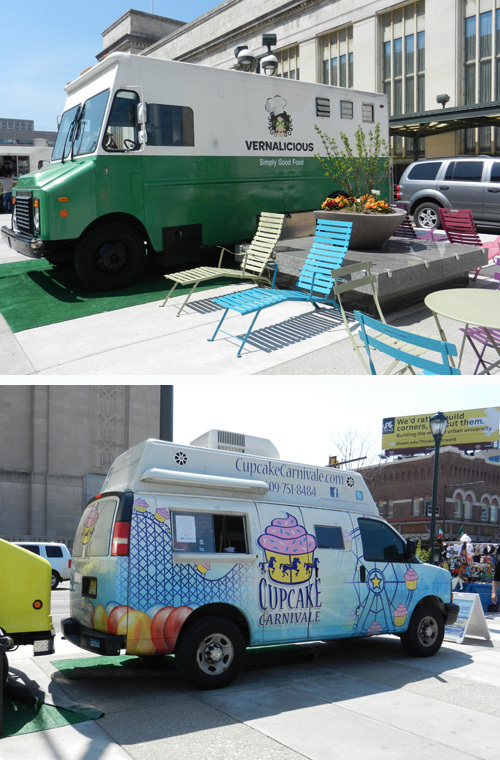 Together 'M' and I sampled a Greek lamb and tzatziki wrap from 'Vernalicious' and for dessert, from 'Cupcake Carnivale', recently rated one of Zagat's 10 best food trucks in the country, a strawberry cupcake with butter cream icing topped with shredded coconut...Yum! Lucky for us, we nabbed the very last one before hearing the words, "Sorry, we're sold out." 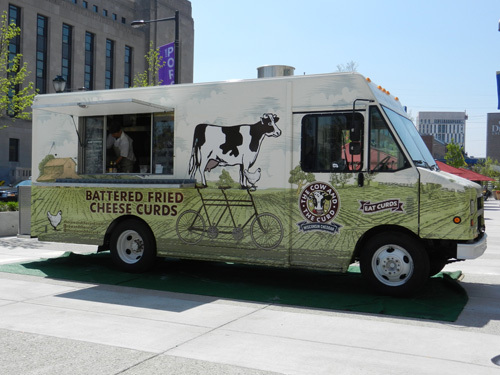 If you're in the city this month and looking for a different kind of food experience, on Wednesdays from 11:30 AM until 2:30 PM Vernalicious will be back at 'The Porch' along with Taco Mondo, Nomad Pizza and Buttercream and on Fridays, same time, Dapper Dog, Pitruco Pizza, Local 215 and Sum Pig will make the rounds with new trucks arriving each month. And so after a day of eating, strolling the city, and looking at galleries, we were ready to catch a train home, but not before checking out a sculpture by artist KWAS, called 'COMPANION' (PASSING THROUGH), temporarily installed inside the station. This piece really tickles my fancy much like the small-scaled plastic designer toys I love to collect. I'm really looking forward to October, when The Pennsylvania Academy of the Fine Arts (PAFA) plans to erect one of KWAS' works on the outside of their building. Kewl! I wish we could have stayed in the city longer to view first hand a spectacular event, part of Philly Tech Week, a giant video game of PONG to be played on the outside of the Cira Centre, a 29 story building with LED's on mirrored glass easily seen from the steps of the Art Museum. Laptop computers, with players selected by lottery, would control the game, an idea brilliantly conceived by Drexel University's Game Designer, Professor Frank Lee. W00t! Once home, I did get to watch the game in action on my computer... after downing a few green olives with pimentos, a tribute to Amy, our friendship, and youth. 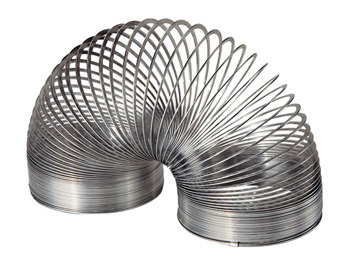 What fun activities or games did you enjoy as a child? Now what makes time fly for you or brings back feelings of being a kid again? 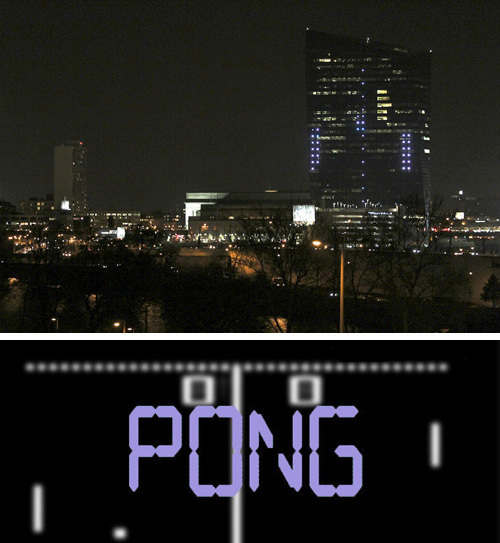 PONG played on the Cira building here. "Monopoly Fans Dump Iron Token For New Cat Piece" here. One thousand 'Ksoid' toys designed by Danil Krivoruchko here. Photographer Gabriele Galimberti's 'Toy Stories here. 14 photographers document their children in 'You Are My Wild' here. To the kid in all of us... boing! It is amazing to me how parallel our interests run or have lain. (always wanted to use that word and now I got the chance :>)) My favorite form of play has always been games. Till this day, I have board, card, word, trivia, etc. games in the basement. They are waiting to be used and on occassion, my wish gets granted. The greatest were always CLUE and GO TO THE HEAD OF THE CLASS. I suspect the later was a big factor in becoming a teacher. The other form of play would be the "make believe" type of game. My old best friend, Sammy, and I would spend hours in Pennypack Park, acting out RAMAR of the JUNGLE scenes, the LONE RANGER adventures, or just pretending we were "Maharajahs". My poor brother got to play "school" with me. I was the teacher of course. Then there were days when we would play "restaurant" and I got to invent dishes for him to eat. That was cut short around age 10, when I concoted the ever delicious fruit, "Plum de Plum" dessert. He loved it so much that he had four helpings. My parents couldn't figure out why he had the "runs" throughout the evening. I suspect it was the plums. Thought it best to stay away from a culinary carreer. Interesting! I hadn't given much thought to the games we played as children as being sort of dress rehearsals for our future lives. You... playing teacher and becoming a teacher then playing a chef and your present day love of cooking and supplying nourishment to others. I too played teacher, put on puppet shows, and created an arts and crafts camp for neighborhood kids later becoming an art teacher. Now I'll have to give serious thought to the relevance of stopping traffic and handing out toothpicks, or a desire to set up a fruit and veggie stand in front of my house. I guess if teaching didn't work out, there was always a backup plan with law enforcement or produce. I really had to laugh at the thought of you and Amy eating a whole jar of olives! Of all things! You made me feel nostalgic at the thought of childhood games and play. A time when we were carefree and knew so little of the world. As an adult I find it hard to find time to "play" without guilt. There are always more "important" things that need to be done first. As a kid, we were outside all day in the summer. We rode our bikes up and down the street (we lived on a dead end road so it was very safe); rode on swing sets and a neighbor's tire swing; jumped rope; played neighborhood games of baseball, Hide & Seek & Tag; took turns giving "rides" in a hammock strung between 2 large trees; climbed the apple tree in the yard next to our house and gave "rides" on one of the lower branches; played basketball games like "PIG" on the hoop that was nailed to a tree by the side of our street. When my dad burned the trash in our vacant lot next to our house, we would get in the barrel (it was an old oil drum) that the trash was dumped out of and roll down the hill into the woods where our ride would be stopped by hitting a tree. It was a harsh ending but the ride was such a thrill! When it rained we played indoor board games (Clue was a favorite) and a game we made up called "Bucket on the Head" in the next door neighbor's basement. When I was in junior high, my family joined a swim club. Our favorite activity during rest breaks was playing cards: Hearts, War, Spit and Damnit were favorites. In the water it was Minnow and Corner Tag. In the winter we went sledding and tobogganing, built caves in snow drifts and played "King of the Hill". I played "Elves and Fairies". We made believe that there were such things and used our imaginations all day making up stories about them and pretending that they really existed. I remember taking baby doll shoes and making little shoe prints in the dust. A little hollow at the base of a big tree was the "door" to their home in the tree. We had a special place in the woods way up past the field that was behind my house where we would go because that was where they "lived". We'd pack a lunch and spend the entire afternoon there. There were two games that I was terrible at and never could master: Jacks and the paddle with the ball at the end of a rubber band. I'm in awe of anyone who can do either of those. Wow Bevo... your comment is a memoir in the making. Incredible! I could really imagine what 'fun' was to you as a child. Great writing! It's hard to imagine you and your family living such a short distance from a big city like Pittsburgh. Climbing apple trees, taking turns on a hammock, and rolling down a hill into the woods inside a barrel, sounds more like living out in the country with a population of a few hundred.... very idyllic. And so sweet... pretend play of elves and fairies. Me?... I grew up on new development that had been a potato farm without a tree in sight for several years. So no climbing for apples or swaying from a hammock. And instead of imagining elves and fairies, I was into cowboys and riding off into the sunset. Funny, what a change in locale can do to a kid's imagination.